Me again to explain my line of thinking from the last post. So if there was confusion on the amount of reading I needed to catch up, my bad. Hope this crazy bit of logic clears up the mud. To start off, I use two hard-drives for my work laptop so that I will not put non-work related items (like pictures, patterns, etc) on the work drive. My DH Rich was kind enough to set up the “play” hard-drive for me. But if I blog during lunch, I sometimes forget and Firefox keeps your pages intact and can accidentally save them on me after the original is uploaded. I did forget that there are a couple of exceptions to the peeves. One touches the contests that require a comment to a particular post, especially for something that I would adore (Kristen’s stitchmarkers, Carole’s STR). Another item to explain is my mentioning of “regional reading” which is a habit I picked up from work. Since I test my web application worldwide, the countries are divided according to regions. Two examples are: NAM (North America) and EMEA (Europe, Middle East, and Africa). For my Bloglines list, I decided to split my “gotta read” blogs into regions and topics (South, Midwest, EMEA, Canada, KAL, Bunnies, Yarn Vendors, Sports, etc). When I read a blog knowing where the writer is located in my list, I feel more in touch with their environment and way of thinking. Finally that my SP9 Spoilee has received her package, I can breathe and post about the project. 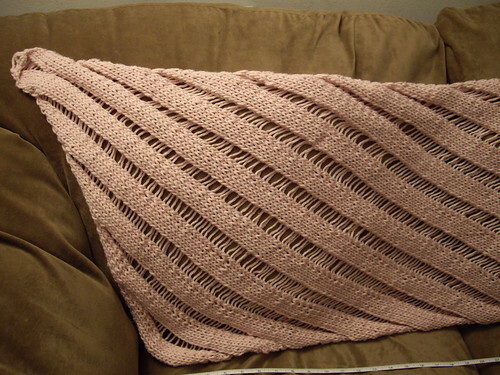 I present to you a Clapotis knitted with 7 hanks of Reynolds’ Rapture in pink #244. The 350 grams of yarn were a great project to knit and I am glad she loves it! Edited to add: I have no idea how it was added in my Bloglines list of Bunny Blogs, but the feed for “Bunny Knits” at bunnyknits.blogspotDOTcom is actually Google’s Blog. How WEIRD is THAT?? I’m going to finish up these toe socks, slap some eyeballs on the fish mittens, and make myself a stinkin’ clapotis. I’ve made two already for other people, but none for myself yet. Argh! I do love it! I do! I do! Thanks again so much…I have had many a compliment on it. It is my favorite knitted item. It’s a scarf, a shawl, an all around amazing knitted being! I am one lucky gal. Love the latest Clappy! Your SP9 is a lucky knitter!!!!! Really! 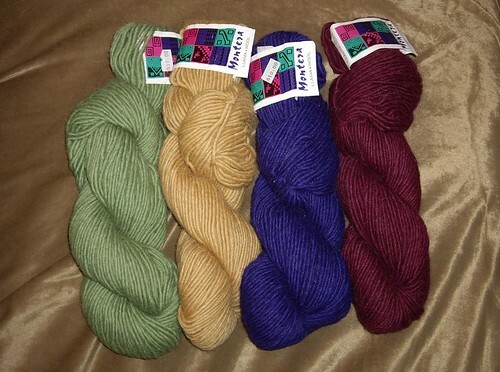 You didn’t need to send me anything but all I know is I want more of that yarn and I can’t wait until the weightloss ends and I start maintenance because biscuits and Vanilla Syrup will be my dinner. Check out the blog late tonight for my public gushing. Not to mention the fabulous needles! I am interested in the balene needles. Wow, your SP is super lucky!!!! Hi, I saw your link on the Destash page. Beautiful clapotis- what a lucky SP!